We’d love your help. 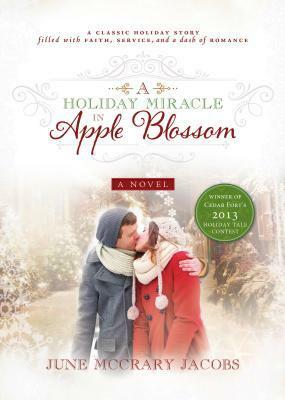 Let us know what’s wrong with this preview of A Holiday Miracle in Apple Blossom by June McCrary Jacobs. To ask other readers questions about A Holiday Miracle in Apple Blossom, please sign up. Amber learns that one of her students, 6-year-old Mary Noel, was involved in an accident over Thanksgiving that wound up killing her dog. She's in the hospital and won't talk to anyone. Amber goes to the hospital to visit her and meets Paul, who works for Mary's father. They become fast friends and decide they want to help Mary's parents with the hospital bills. Their plans are big and will require lots of community help. Can they pull off a Christmas miracle? This is a fun, fast read. Amber and Amber learns that one of her students, 6-year-old Mary Noel, was involved in an accident over Thanksgiving that wound up killing her dog. She's in the hospital and won't talk to anyone. Amber goes to the hospital to visit her and meets Paul, who works for Mary's father. They become fast friends and decide they want to help Mary's parents with the hospital bills. Their plans are big and will require lots of community help. Can they pull off a Christmas miracle? This is a fun, fast read. Amber and Paul become very close very fast and in the context of what they were trying to accomplish, I was able to buy into it. Their relationship flowed easily and there wasn't any kind of drama. Because the book is short, we don't get a lot of character development around them but I thought they were sweet together. I've never lived in a small town and this book has that definite small town feel which makes me wish I knew what it felt like. Lots of people in the community pull together to do what they can to help Mary start to heal and put a smile on her face again. I loved the feel of people working together for a good cause, and Christmas is always a time of year when people are even more generous. Everything does come together easily in this book and it was a nice change of pace for me. If you're looking for a quick, feel good Christmas story, this is a book you will want to pick up! Amber is pretty fresh to Apple Blossom, but she absolute loves teaching. However, right before Christmas, her student Mary Noel is involved in a tragic accident. Now Amber wants to try and do everything she can to make it better. With the help of a new-found friend, Amber may be able to help her pupil, her pupil's family, and even help herself in the process. This is a relatively short but fun read. Amber is a young teacher who would do anything for her class, and this love of her students is soo Amber is pretty fresh to Apple Blossom, but she absolute loves teaching. However, right before Christmas, her student Mary Noel is involved in a tragic accident. Now Amber wants to try and do everything she can to make it better. With the help of a new-found friend, Amber may be able to help her pupil, her pupil's family, and even help herself in the process. This is a relatively short but fun read. Amber is a young teacher who would do anything for her class, and this love of her students is soon put to the test. Amber's young pupil Mary Noel is involved in a sad accident, and Amber just knows she must do something. While visiting Mary Noel, Amber meets a friend of the family, the dashing and sweet Paul. Amber and Paul are a great match in multiple ways. They grow closer as they work to serve Mary Noel and her family. If you are looking for a sweet romance that will raise your spirits for the holidays, this is a great choice. If I had one little complaint, it would be that Amber and Paul were a little too perfect. I mean they practically had no flaws. However, if you're escaping from the business of the holidays, you may want a story with very little to bring you down. This story just lifts up. It is a fun and quick read for your holiday season. This was a simple, sweet Christmas story. Amber is a school teacher and when one of her students is involved in an accident, the town rallies around to help cheer her up and to help pay for her medical costs. romance quickly blossoms. This romance becomes one of the main two points to the story. This novella is on the shorter side, so we don't really get to know Amber and Paul really well. I thought they were both a little aw This was a simple, sweet Christmas story. Amber is a school teacher and when one of her students is involved in an accident, the town rallies around to help cheer her up and to help pay for her medical costs. romance quickly blossoms. This romance becomes one of the main two points to the story. This novella is on the shorter side, so we don't really get to know Amber and Paul really well. I thought they were both a little awkward, especially when they would text each other, but it was very endearing and sweet. Typically, it's not very believable to me when everything works out so quickly and so neatly, however, with this feel-good holiday story, anything is possible and it works. It's the type of sweetness and fluff recipe that is filled with kindness and hope--which is a must for a good Christmas story; it's the makings of a good Hallmark Christmas movie. Content: Christian undertones, kissing, CLEAN!! I am hosting a giveaway of this book on my blog. Enter to win an e-book!! This was a sweet, tender read. Amber and Paul come together to help Mary Noel to heal after she is hit by a car. Her family has a huge medical debt. This is definitely a HEA, feel good, short, holiday read. If you enjoy a little bit of tension, lots of sweet falling, and not much conflict, this is a sweet story of a couple that find each other, healing for a family, and a community pulling together to help raise funds for hurt little girl. I think this is a cute and sweet story. I appreciate that the author wants to write and it is commendable that she has written her first novel. However, this book has some problems. The author opened the door for some competition for Paul where Todd Crocker was concerned. At first sight I could tell that Todd was an obnoxious guy but the book didn't contain any excitement. There was no antagonist in the book, therefore, no way for the characters to overcome something. I think the author needs to I think this is a cute and sweet story. I appreciate that the author wants to write and it is commendable that she has written her first novel. However, this book has some problems. The author opened the door for some competition for Paul where Todd Crocker was concerned. At first sight I could tell that Todd was an obnoxious guy but the book didn't contain any excitement. There was no antagonist in the book, therefore, no way for the characters to overcome something. I think the author needs to consider putting in a challenger for Paul. Not really a Love triangle but just something for the reader to read. The idea behind the fund raiser was good but everything sort of fell into place and there wasn't much "challenge" in the book. Because of the length and lack of things happening, the book was sort of boring. In addition, I felt the character development to be lacking. We get to know Paul pretty well from what he tells Amber but we don't learn much about her. Why is she living in this town? Who is she? Where is the town? The supporting characters are also weak. We don't need to know so much about them but when the supporting characters really support the plot, then I think there needs to be more substance behind their characters. Really the book is lacking a whole lot of character development. The author is real heavy on the Christian aspect of the book. I've never met anyone or any couple who prayed about their relationship with each other. This happens several times in the book. I just think this is too over the top. It was strange for me and didn't feel like something that should be in a novel. The interactions are very sweet but over and beyond what I would consider normal. The book centers around a fund raiser for a little girl, Mary Noel, but the reader doesn't even get to know the little girl, nor her parents. I would have liked to have learned more about these characters, since the plot was devised around them and their tragedy. The fund raiser wasn't exciting because everything happens so smoothly. People come from neighboring towns and they support the crap out of it and its all just too perfect. The story just really needs some flaws and some chances for the characters to overcome themselves, a trial, like the accident, or someone having to make a Huge decision. Just Something! "Her leg and arm were still in casts, but the patient was no longer in physical pain." This statement really bothered me. It is in reference to Mary Noel when she is being released from the hospital to attend the Fair. I just think this statement was a poor choice for the author. Lastly, the texting in the book is very odd. It's as though the characters were writing letters instead of texting. "See you at five. Fondly, Amber." No one talks like this. It felt like the author didn't have a clue about texting. Overall, the lack of anything exiting happening in the book was it's biggest flaw. Then, there was way too many Christian elements to it. Ones that I would surmise most Christians don't even practice so it comes off silly and I couldn't relate o the characters. I ended up not recommending this book because I feel it still needs more editing. It just wasn't ready to be published. A copy was provided by Cedar Fort and NetGalley in return for an honest review. For a debut novel this novella was okay, and enjoyable enough but I can't say that it was great. Rated it 2.5/5. I love Christmas novels they are always laced with kindness and miracles. It's also nice to think about small town communities who will rally around their neighbors in their time of need. That is the type of novel A Holiday Miracle in Apple Blossom. When 6 yr. old Mary Noel is hurt and traumatized by seeing her little dog killed she stops speaking to everyone. She lays in the hospital For a debut novel this novella was okay, and enjoyable enough but I can't say that it was great. Rated it 2.5/5. When 6 yr. old Mary Noel is hurt and traumatized by seeing her little dog killed she stops speaking to everyone. She lays in the hospital silent and the medical bills are piling up. When her teacher Amber finds out about what has happened she comes and visits the little girl. While she is there she runs into a man named Paul. Paul works for Tim the father of the little girl and Amber and Paul seem to hit it off right away. She is struck by Paul's kind and compassionate ways. When they find out how huge the medical bills are they devise a plan to help the family out. They are going to have a festival in honor of Mary Noel. They are hoping that it will get the little girl to open up and come out of her silent shell she has sunk into. The community rallies around the idea and a variety of different people in the community volunteer their services. While planning the event Amber and Paul grow closer. I didn't realize that this novel was going to be more of a Christian novel when I grabbed it up so I do want to make sure that others know. It was a a squeaky clean read with some religious undertones. I think I would have liked it better if it wouldn't have been so syrupy sweet. Not that I mind clean reads, but it just oozed of sappy sweetness. I know that characters in novels fall in love rather quickly but to me this was just a little two quick. I am not one for love at first sight. There was no conflict in the story which usually happens in most romances. This is a good Christmas story. The reasons I gave it 5 STARS it touched me in so many ways. I cried some sad tears in the beginning, In part of the story I wanted to shout for joy. I even cried some happy tears. The characters to me were real. The setting was a small community. That one brand new teacher made a difference and got the town to work together for one little girl and her very worried parents. The drama starts right off and touches the heart strings from the first page. Amber learns one of her student Mary Noel was hit by a car. She will heal with broken bones but worst of all her puppy was with her and died. Mary Noel saw all the blood and injuries. She has closed down has not spoken since. Before Amber can say anything to her students they all tell her about Mary Noel and her dog. Amber's class pull together for Mary Noel they make lots of cards for her hospital room and other things. Just thinking about the story makes my eyes water again. It is so neat to see all the people pulling together to help where they can. They make a big difference by working together. Paul works with Mary Noel's father. He helps keep the business going while Mr. Simmons stays at the hospital. They won't let Mary Noel leave until she opens emotionally. Paul and Amber meet in the hospital and start working together and come up with a plan to help. As they are working they start to fall in love very vast. This book is a clean read, It does feature church, prayer and Christmas eve midnight service. It all fits so well into the story. I will look forward for more books from June McCrary Jacobs in the future. I really enjoyed her first novel. I love Christmas and everything that has to do with the spirit of Christmas (joy, hope, love, etc. ), and A Holiday Miracle in Apple Blossom embodied the Christmas spirit perfectly. I loved everything about this short story from the characters to the community to the hope and faith. I loved how relateable and kind the characters were. Amber was the perfect teacher with that magical touch, kindness, and a gift for knowing the right thing to say in every situation. Paul was so kind, caring, and help I love Christmas and everything that has to do with the spirit of Christmas (joy, hope, love, etc. ), and A Holiday Miracle in Apple Blossom embodied the Christmas spirit perfectly. I loved everything about this short story from the characters to the community to the hope and faith. I loved how relateable and kind the characters were. Amber was the perfect teacher with that magical touch, kindness, and a gift for knowing the right thing to say in every situation. Paul was so kind, caring, and helpful. Their relationship was perfect! I had so much fun watching them get to know each other and reading the balance of witty humor and serious conversation, but my favorite thing about their relationship was how they trusted in God together with their relationship and prayed about it together. I hope someday I have a relationship like that! Sweet and tender...A PERFECT book for the holidays! A tragic accident overcome by faith. A man and woman falling in love. A community coming together to help out a family in need. A holiday festival based on angels. Rejoicing in the birth of our Savior. Mary Noel has been hit by a car. She survives, but her dog doesn't. Devastated, Mary Noel refuses to look at anyone or even speak to anyone. Amber and Paul come together to plan a holiday festival like none other, including all of M Sweet and tender...A PERFECT book for the holidays! Amber and Paul come together to plan a holiday festival like none other, including all of Mary Noel's favorite things...like the color blue and angels...in order to help the family pay for the medical expenses. The community comes together to help; and there truly is a miracle on Christmas Eve in Apple Blossom. Miracles touch each heart differently…..
Amber’s first year of teaching six-year olds was going well, until the principal brings an announcement that will forever alter Amber's world. A car accident has devastated the life of one of her students, leaving her uncommunicative and withdrawn. Will Amber be the key to the child’s recovery? Are there others willing to help? Working with a new found friend Paul, Amber met in the hospital, they pull together a wonderful plan. It will take a miracle of c Miracles touch each heart differently…..
Will Amber be the key to the child’s recovery? Are there others willing to help? Working with a new found friend Paul, Amber met in the hospital, they pull together a wonderful plan. It will take a miracle of cooperation and support of the whole town to be successful. The results are surprising. Many lives are changed as the holiday spirit spreads from one family to another. Amber and her friend Paul are no exception. A charming holiday tale to lift your spirits! This review has been hidden because it contains spoilers. To view it, click here. When 6 year old Mary Noel has a car accident and watches her precious dog die in front of her eyes she shuts down and shuts the world out Amber and a man she met while visiting Mary Noel take it upon themselves to work a miracle and try to work on a festival for Mary Noel and their family. Alot of people come together to provide a Christmas miracle for Mary Noel and her parents. As Paul and Amber's relationship continues to flourish as time passes. The more time that passes the stronger their con When 6 year old Mary Noel has a car accident and watches her precious dog die in front of her eyes she shuts down and shuts the world out Amber and a man she met while visiting Mary Noel take it upon themselves to work a miracle and try to work on a festival for Mary Noel and their family. If you are looking for an inspirational short st The two best adjectives I can think of to describe this novel are sweet and gentle. It will remind you of all the best things about Christmastime. This is a sweet little book that warms the heart. It nicely portrays the kindness and compassion of a close-knit community after a young girl is injured. It also follows the delightful romance of a young couple in a faith based relationship. All-in-all, a very pleasurable read. Sweet and sappy, no conflicts, just a straight forward story of 2 people falling in love while giving service to others, just the light stuff that's good for the holidays. This book was pretty dry. I read the book but would not recommend anyone else. Too sweet and no romance to it. Just couldn't get into this book. The writing just wasn't interesting. It was a sweet idea. I always like commenting on the cover of a book because I like for the cover to introduce the book so to speak. It should set up the story. The cover of A Holiday Miracle does just that. It leads the way to a season of miracles. The story is a sweet love story, but it encompasses more than that; it's a town full of generous and kind-hearted people that makes it a perfect book for the upcoming holiday season. There were times when I thought the writing was a little too perfect and there were places I always like commenting on the cover of a book because I like for the cover to introduce the book so to speak. It should set up the story. The cover of A Holiday Miracle does just that. It leads the way to a season of miracles. There were times when I thought the writing was a little too perfect and there were places where the author added words where none were needed. An example would be describing the restaurant where the characters were eating. The description was ample at the beginning of the date and I felt saying, "...they left the fine restaurant..." a little odd. I am stating my thoughts and preferences on the writing. The author tended to use "bigger" words than you might ordinarily find in a book. I enjoyed those moments as I am a "big" word person. I love words and I found it interesting that an author would choose to write this way. The norm is to write on a lessor intelligent level so you fly through the book. This was enjoyable in that aspect. I did find the story a little sugary and it had no conflict. It was almost too perfect and didn't imitate life. Overall, I enjoyed the book and can recommend it for those of you looking for an uplifting holiday book to read. First the storyline for this book was very sweet and heartwarming christian story. Amber is a first grade teacher who finds out one of her students was injured in a car accident and lost her dog in that accident. The little girl is traumatized into not speaking. Amber meets an employee of the girls father and they embark on a sweet romance while trying to bring a town together to help the family with the mounting medical bills as well as trying I received an ARC of this book for an honest review. First the storyline for this book was very sweet and heartwarming christian story. Amber is a first grade teacher who finds out one of her students was injured in a car accident and lost her dog in that accident. The little girl is traumatized into not speaking. Amber meets an employee of the girls father and they embark on a sweet romance while trying to bring a town together to help the family with the mounting medical bills as well as trying to lift the girls spirits. In the end there is a HEA. This is a heartwarming story. It is a great little book to be enjoyed during the Christmas season. Amber Kellen is informed by the Principal of the school she teaches at that one of her students has been in an accident. The little six year old is traumatized. She was injured, but watched her beloved dog killed in the accident. She has slipped into depression, and is struggling. To help the family with their astronomical medical bills, Amber teams up with Paul to figure out ways to help out the fam This is a heartwarming story. It is a great little book to be enjoyed during the Christmas season. To help the family with their astronomical medical bills, Amber teams up with Paul to figure out ways to help out the family. What ensues is a miracle. The main miracle may be the bringing of Amber and Paul together. This book is illustrates the love of the Savior during the sacred season of Christmas. In so many ways, Amber and Paul, seek the will of the Lord and ways that they can help to bring to pass His purposes. A Holiday Miracle in Apple Blossom is a sweet, contemporary romance set in Apple Blossom, Vermont. The two main characters are well thought out. An entire community rallies around when a first grader is hit by a car and her dog is killed. Compassion and caring dominate this novella. June McCrary Jacobs has done an excellent job with her first novella. I won this book from a giveaway on Engrafted Word. Recommended to Jane by: Found it displayed at the library. This very short, "feel-good" story is the type Hallmark makes into a TV movie. A car accident injures a 6 yr old girl, but kills her dog. The trauma of seeing her "best friend" dying has taken her speech. Her school teacher, along with a new-found, organize a fundraiser with the community to assist the parents with their medical bills. You'll have to read the story to see if the little girl recovers. It's a quick read, and enjoyable, but I gravitate toward novels with more substance. I thought the book lacked substance. There was no real conflict between any of the characters or in the characters life. You didn't get to know the characters very well. Within two weeks they are able to pull off a fundraiser to the degree and success that they had seemed very unreal to me. Overall the storyline didn't seem believable to me. This novella is completely clean in language and content. It was cute but a little more simple than I generally like. I really enjoyed the snow festival though and wish I had been able to attend. This book was a quick read, but a little boring. The way every little thing fell into perfect place was a little over the top. Paul and Amber were knew they were perfect for each other from the start. No conflicts but also not many fireworks. I like Christian books but felt this one was a bit much. 'Handmade Hearts', the author's historical romance short story was released at the end of 2018. 'Robin's Reward', a contemporary inspirational romance, was released in 2015. June's inspirational Christmas novella, 'A Holiday Miracle in Apple Blossom', winner of Cedar Fort Inc.'s 2013 Holiday Tale Contest, was released in 2013. Over one hundred of June's original sewing projects and articles have been published in sewing books and magazines and sewing industry blogs. A Californian since age six, June enjoys reading, writing, visiting historic homes and museums and gardens, photography, cooking, designing, sewing, quilting, sewing for charity, and hand-embroidery.